New search options in the systematic tree of the ‘Archaeological Bibliography’, Dyabola! In April 2713 new titles! We have created new levels and subdivisons in the systematic search of the “Archaeological Bibliography, Projekt Dyabola”, to offer you a even more accurate search. 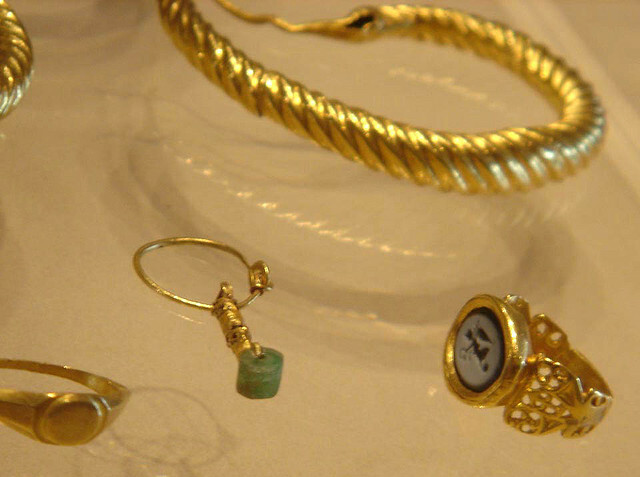 Under “jewelery” you will find two new categorie “finds”, which itself has been subdived topographically and “collected material”. In the last years, we have concentrated on extending the systematic tree for thoses objects (lampes, terracottas, glass, brooches and jewelly), which are mainly evaluated as finds from excavations subdividing the bibliographical references topographically. We hope that an easy access to publications of analogous material in the same region may facilitate your research. In April we have evaluated 155 new monographs and 90 new volumes of periodicals, gaining 2713 new titles for the “Archaeological Bibliography ”. You will find the list of new monographs (also in pdf) and periodicals below as ever. Apuleius and Africa. (New York, Routledge, 2014), ed. Lee, B.T. ; Finkelpearl, E.; Graverini, L.
Arianism. Roman heresy and barbarian creed. (Farnham, Ashgate, 2014), ed. Berndt, G.M. ; Steinacher, R.
Attikés odoí, 2. Oi protoi chartes tes poleos ton Athenon. Fauvel 1787. Kleanthes-Schaubert 1831-1832. Weiler 1834. Schaubert-Stauffert 1836. Stauffert 1836-1837. F. Altenhofen 1837. “Epitrope 1847”. (Athéna, Mélissa, 2010), ed. Korres, M.
Bakke-Alisøy, H.; Bjune, A.E. ; Drocourt, N. u.a. :Tegea, 2. Investiagations in the sanctuary of Athena Alea 1990-94 and 2004. (Athens, The Norwegian Institute at Athens, 2014), ed. Østby, E.
Barello, F.: Villa romana di Almese. (Almese, Comune di Almese, 2014) 39 S., Abb. Brill’s companion to Valerius Flaccus. (Leiden, Brill, 2014), ed. Heerink, M.; Manuwald, G.
Des vestiges aux sociétés. Regards croisés sur le passage des données archéologiques à la Société Sous-Jacente. Actes de la 6øJournée doctorale d’archéologie, Paris, 25 mai 2011. Travaux de l’Ecolle doctorale d’archéologie. (Paris, Publications de la Sorbonne, 2005), ed. Trémeaud, C.; Vallette, T.; Brancier, J.
Formiae. Una città all’inizio dell’impero. Bimillenario della morte di Augusto. (Formia, Ministero dei beni e delle attività culturali e del turismo, 2014), ed. Cassieri, N.
Foundation myths in ancient societies. Dialogues and discourses. (Philadelphia, University of Pennsylvania Press, 2014), ed. Mac Sweeney, N.
Glacies. L’età dei ghiacci in Friuli. Ambienti, climi e vita negli ultimi 100.000 anni. Catalogo della mostra. (Udine, Comune di Udine, 2003), ed. Muscio, G.
Heaven and earth. Art of Byzantium from Greek collections. [Exhibition Washington, D.C. October 6, 2013 – March 2, 2014 and J. Paul Getty Museum, Los Angeles, April 9 – August 25, 2014. ](Athens, Hellenic Ministry of Culture, 2013), ed. Drandaki, A.; Papanikola-Bakirtzi, D.; Tourta, A. Heaven and earth. Cities and countryside in Byzantine Greece. [Exhibition Washington, D.C. October 6, 2013 – March, 2, 2014, J. Paul Getty Museum, Los Angeles, April 9 – August 25, 2014. ](Athens, Hellenic Ministry of Culture, 2013), ed. Albani, J.; Chalkia, E.
Hipponion, Vibo Valentia, Monsleonis. I volti della città. (Reggio Calabria, Laruffa, 2014), ed. Iannelli, M.T. Il culto degli antenati a Veio. Nuove testimonianze da scavi e ricerche recenti. [Mostra Formello, 10 dicembre 2011 – 11 novembre 2012. ](Roma, Officina Edizioni, 2011), ed. Bartoloni, G.
Il viaggio in Italia di Giovanni Gargiolli. Le origini del Gabinetto fotografico nazionale 1895 – 1913. (Roma, Istituto centrale per il catalogo e la documentazione, 2014) Mostra Roma 27 novembre 2014 – 30 gennaio 2015, ed. Marsicola, C.
Imperien und Reiche in der Weltgeschichte. Epocchenübergreifende und globalhistorische Vergleiche. (Wiesbaden, Harrassowitz, 2014), ed. Gehler, M.; Rollinger, R.
Kokkorou-Alevras, G.; Kalopissi-Verti, S.; Panayotide-Kesisoglou, M.: The sanctuary of Apollo and the early Christian settlement at Kardamaina (ancient Halasarna) on the island of Kos. (Athens, Cultural society of Koans, 2006) 77 S., Abb. L’antiquité et la vie des arts. Contributions scientifiques et pédagogiques. (Toulouse, Presses universitaires de Franche-Comté, 2012), ed. David, S.
Loiacono, M.; Archontidou, A.; Agab, S.R. u.a. :Per Antonio di Vita. Mnemes charin. (Roma, Edizioni Simple, 2013) 64 S., Abb. Opper, T.: The Meroë heat of Augustus. (London, The British Museum, 2014) 64 S., Abb. Orucheia sto Aigaio. Biomechanike archaiologia sten Ellada. (Athéna, Mélissa, 2009), ed. Delavilas, N.; Papastephanake, L.
Potere e pathos. Bronzi del mondo ellenistico. [Mostra Firenze, 14 marzo – 21 giugno 2015, Los Angeles, 28 luglio – 1 novembre 2015, Washinghton D.C., 6 dicembre 2015 – 20 marzo 2016. ](Firenze, Giunti, 2015), ed. Daehner, J.M. ; Lapatin, K.
Preaching and political society. From late antiquity to the end of the middle ages. Depuis l’antiquité tardive jusqu’à la fin du moyen âge. (Turnhout, Brepols, 2013), ed. Morenzoni, F.
Preistoria dell’Italia settentrionale. Studi in ricordo di Bernardino Bagolini. Atti del Convegno. Udine, 23-24 settembre 2005. (Udine, Comune di Udine, 2006), ed. Pessina, A.; Visentini, P.
Religiosidad, rituales y práticas mágicas en los mosaicos romanos. (El Boalo, Selbstverlag, ), ed. Neira Jiménez, L.
Scipione l’Africano. Un eroe tra Rinascimento e Barocco. Atti del convegno di studi. Roma, Academia Belgica, 24-25 maggio 2012. (Milano, Jaca Book, 2014), ed. Geerts, W.; Caciorgna, M.; Bossu, C.
Seeraub im Mittelmeerraum. Piraterie, Kosarentum und maritime Gewalt von der Antike bis zur Neuzeit. (Paderborn, Schöningh, 2013), ed. Jaspert, N.; Kolditz, S.
Space in hellenistic philosophy. Critical studies in ancient physics. (Berlin, de Gruyter, 2014), ed. Ranocchia, G.; Helmig, C.; Horn, C.
Speleologia e archeologia a confronto. Atti del convegno, Chiusa di Pesio – Ormea, 9-10 giugno 2007. (Torino, Soprintendenza per i beni archeologici dell’Emilia Romagna, 2011), ed. Venturino Gambari, M.
Sulle rive dell’Acheronte. Costruzione e percezione della sfera del post mortem nel Mediterraneo antico, 1. Egitto, Vicino Oriente antico, area storico-comparativa. (Roma, Quasar, 2014), ed. Baglioni, I.
Sulle rive dell’Acheronte. Costruzione e percezione della sfera del post mortem nel Mediterraneo antico, 2. L’antichità classica e cristiana. (Roma, Quasar, 2014), ed. Baglioni, I. Tell Tuqan excavations and regional perspectives. Cultural developments in inner Syria from the early bronze age to the Persian-hellenistic period. Proceedings of the International Conference May 15th – 17th 2013. Lecce. (Galatina, Congedo, 2014), ed. Baffi, F.; Fiorentino, R.; Peyronel, L.
The Cambridge history of painting in the classical world. (Cambridge, Cambridge University Press, 2014), ed. Pollitt, J.J.
Torcello scavata. Gli scavi 1995 – 2012. Patrimonio condiviso. Izkopan Torcello. Izkopavanja 1995 – 2012. Skupna dediscina. Torcello excavated. The 1995 – 2012 excavation campaigns. A shared heritage. (Venezia, Regione Veneto, 2014) 2 Bde., ed. Fozzati, L.
Vivre sous terre. Sites rupestres et habitats troglodytiques dans l’Europa du Sud. Actes des 2ø, 3ø et 4ø colloques de Saint-Martin-le-Vieil (Aude). (Rennes, Presses universitaires de Rennes, 2014), ed. Gardel, M.E. ; Loppe, F.; Wiss, R.
Vorster, C.: Staatliche Kunstsammlung Dresden, Skulpturensammlung. Katalog der antiken Bildwerke, 3. Die Porträts. (München, Hirmer, 2013), ed. Knoll, K.; Vorster, C.
Posted in Archäologische Bibliographie, Projekt Dyabola, Update Announcements | Comments Off on New search options in the systematic tree of the ‘Archaeological Bibliography’, Dyabola! In April 2713 new titles!